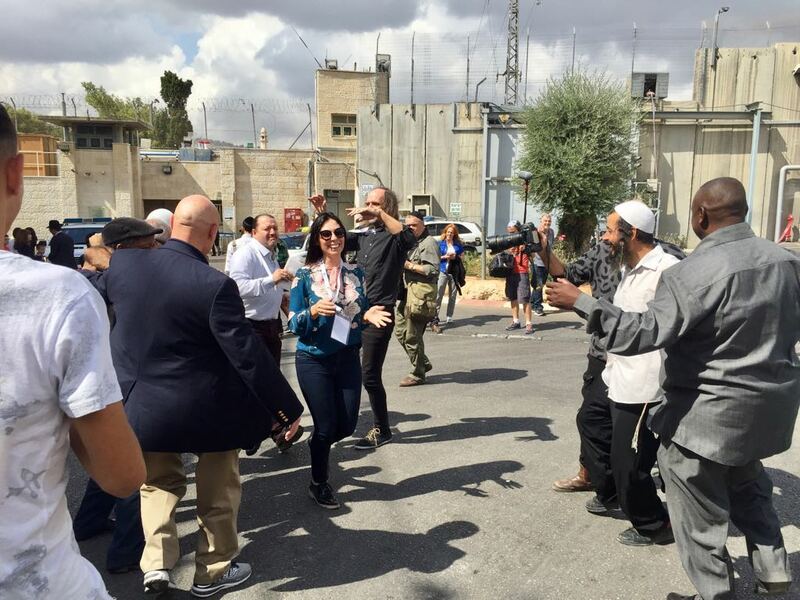 Minister: ‘Enough Being Politically Correct, Let’s Be Biblically Correct’ - Breaking Israel News | Latest News. Biblical Perspective. Faith-based diplomacy is leading the efforts against delegitimization of Israel, said Josh Reinstein, president of the Israel Allies Foundation (IAF) on Monday. 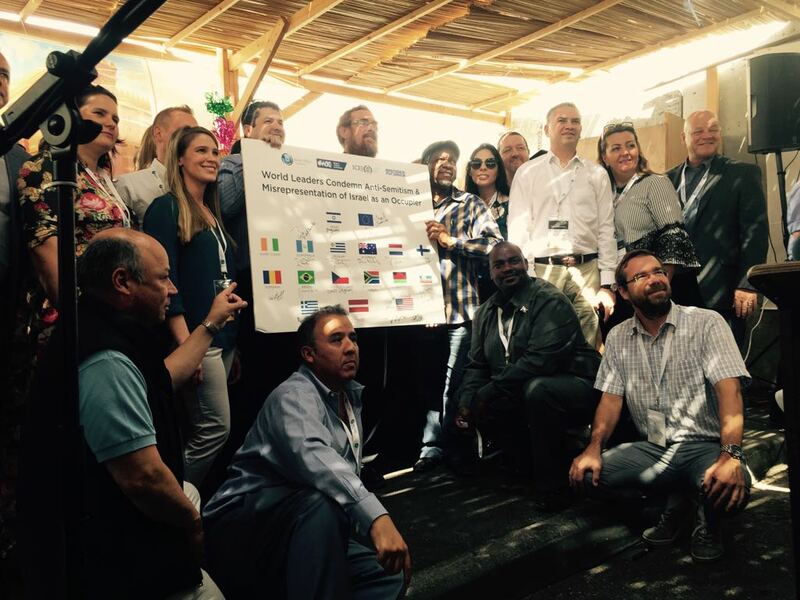 This week, IAF, together with the World Jewish Congress, the International Christian Embassy in Jerusalem (ICEJ) and Bridges for Peace, brought 27 members of parliament (MPs) from 15 countries to Israel for the Jerusalem Chairman’s Conference to arm participants with the inspiration and clarity they need to defend the State of Israel in their home countries. “We witness once again the rise of anti-Semitism around the world, which is often couched in political stances against Israel’s right to exist,” said Reinstein. On Monday, the delegation signed a resolution forcefully rejecting all declarations seeking to deny Israel’s and Jerusalem’s Jewish origins, as well as any misrepresentation of the Jewish State of Israel as an occupier. Minister of Social Equality Gila Gamliel (Likud) accepted the resolution on behalf of the Israeli government. She said the resolution comes at an especially important time, when so many organizations and people are trying to re-write history. 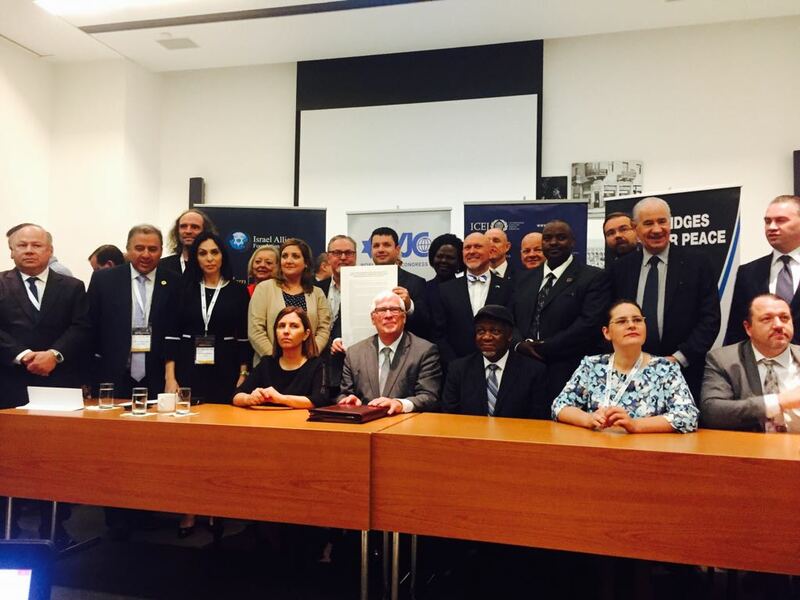 The IAF, founded by the late Israeli Minister and Rabbi Binyamin Elon – the father of faith-based diplomacy, according to Reinstein – works with parliaments around the world to mobilize political support for Israel based on Judeo-Christian values. 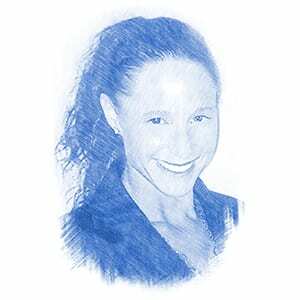 According to Reinstein, IAF has more than 1,000 parliamentarians from around the world in its network. “Benny had a vision of the restoration of Israel and for the whole world to take part in that,” said IAF executive director Daniel Williams, who noted that many MPs put their political careers at risk to visit and outwardly support the State of Israel. The MPs toured the country, including visits to the Tomb of Rachel in Bethlehem and several holy and strategic sites throughout Samaria. Events culminate Tuesday evening with Israeli Night at the ICEJ’s Feast of Tabernacles. The purpose of these visits was two-fold. First, IAF wanted the visitors to walk through the streets of God’s Promised Land and witness verses from the Bible coming alive before their eyes, said Reinstein. And second, the organization sought to help them understand the strategic necessity of these areas, said Samaria leader Yossi Dagan. 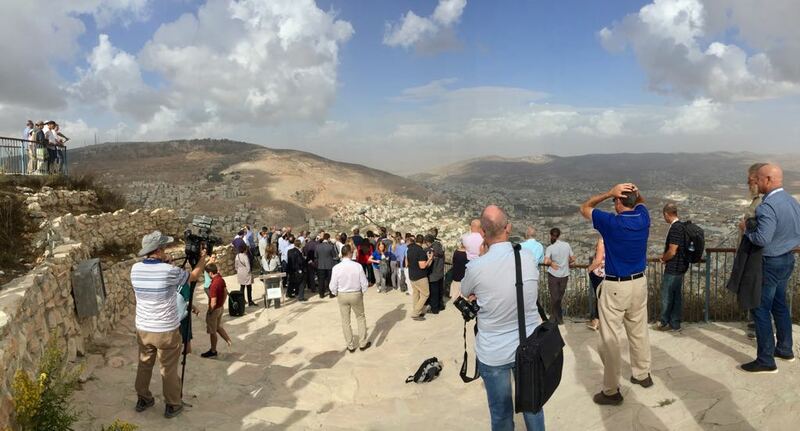 In a briefing on Mount Gerizim in Samaria, Dagan explained that if Israel were to give up Samaria as part of a peace process, there would be only 15 kilometers between Israel’s major cities and the closest Arab neighborhoods. The Israeli border would be indefensible. Dagan said, however, that he does not believe these kinds of sacrifices will need to be made, because God promised this land to the Jewish people. Both Dagan in Samaria and MK Yehudah Glick in Bethlehem called on MPs to help explain the truth about Israel to the world. Glick said MPs have a Biblical choice to make. At the backdrop of the conference were several murmurings about the recent statement by President Donald Trump that he will likely wait to move the United States Embassy to Jerusalem until Israel and the Palestinians are further along in the peace process. “In the Middle East, where we live, the fact that terrorism is here is not because we gave up the idea of a peace process, but because they [the Arabs] would like to remove Israel from the map of the Middle East…We need to see all embassies in Jerusalem and make sure Jews can build their houses here,” Hotovely said. Similarly, Glick said “real peace” will only be when the world recognizes Jerusalem as the eternal capital of the Jewish people. Visitors also focused on the impact of the Boycott, Divestment and Sanctions (BDS) movement on Israel. There were nine Republican and Democratic representatives on the mission from South Carolina, the state that penned and passed the first anti-BDS legislation banning the state from entering into contracts with companies that participate in certain kinds of boycotts. That legislation has served as a model for more than 50 similar laws, which have been passed in the US and around the world. Christian love and hope for the State of Israel came out in many different forms throughout events. The MPs were not shy about their beliefs in Biblical prophecy as it pertains to Israel and the blessings they hope to receive for their own countries as a result. MP Reverend Malani Mtonga from Malawi stated that his country seeks God’s blessings and that by blessing the Nation of Israel, he believes Malawi will also be blessed. “I feel revived coming here and every time I go back I feel even more energized to preach,” Malawi said. Sukkot is a time in which nearly 50,000 Christians visit Israel to celebrate the Feast of Tabernacles. More than 6,000 visitors take part in ICEJ’s Feast of Tabernacles program and the rest are on other private or diplomatic tours. According to the Torah, Sukkot is a universal and not just Jewish holiday. For example, offerings were made in the Temple on Sukkot on behalf of the 70 nations of the world. The prophet Zechariah describes how non-Jews will flock to Jerusalem on Sukkot in the messianic age. 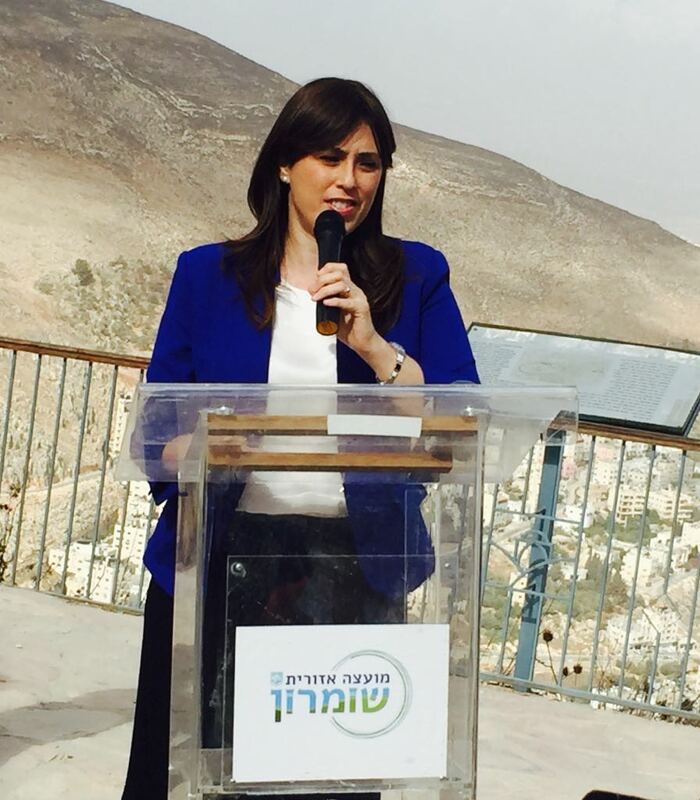 Hotovely said Sukkot celebrates the connection between the people here in Israel and the people all around the world. “We are celebrating together our ability to bring prosperity to the world that is starting from here, from the holy land, from Israel,” she said. Glick took this a step forward. 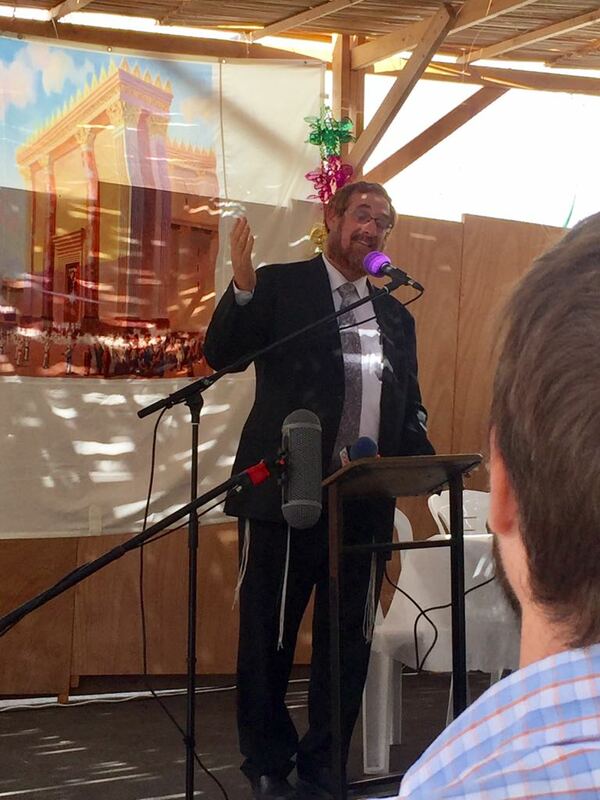 He said not only is Sukkot universal, but so is the entire redemption. “The redemption will not just be for the people of Israel, but the entire world – the entire world will be brought back to recognize God,” said Glick. Uri Bank, who today serves as an adviser to Glick and worked alongside the late Elon, said that Elon used to believe Jerusalem and all of Israel’s holy sites belong to all people who believe in the Bible. However, he said that Elon taught that faith is not enough.